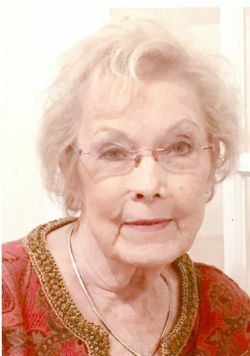 Funeral services for Evelyn Louise Weeks, age 86, of Jones Creek will be held at 2:30 p.m. on March 21, 2019 at Lakewood Funeral Chapel. The family will receive friends at Lakewood Funeral Chapel at 2:30 on March 21. Evelyn was an Eastern Star, employed by Rhône-Poulenc, held ties to Cowboy church in Brazoria. She loved to dance, laugh with friends and family, and enjoyed traveling with her husband. She loved Gene Watson, and being with her family and friends. Evelyn was preceded in death by her dad, Ervin Herbert Scott; mom, Essie Nora Scott; baby brother, Clayton Scott; brother, Milton Dan Scott Sr.; husband, Eddie Weeks; son, Jimmie Dale (Butch) Holden Jr.; and nephew, Milton Dan Scott Jr.
She is survived by her husband, Joe Goens; granddaughter, Shannon Beck; great grandchildren, Hunter Clayton Kelley, A'mylie Rese Beck; ex-daughter-in-law, Zella Jean Harvey; and her step children, Ramona, Joe, and Kathleen; nephew, Gary L. Scott and wife Kim; great nephews, Stephen M. Scott, and Jake T. Scott; and extended family.